My wife, 2 kids (2yr and 1 month) and I are in the process of building our dream home. 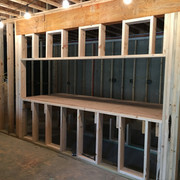 During the framing of the house, I have been planning the build of a monster reef tank. 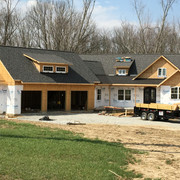 I own my own construction company building custom homes and because of my construction background, I plan on doing a lot of the work myself. 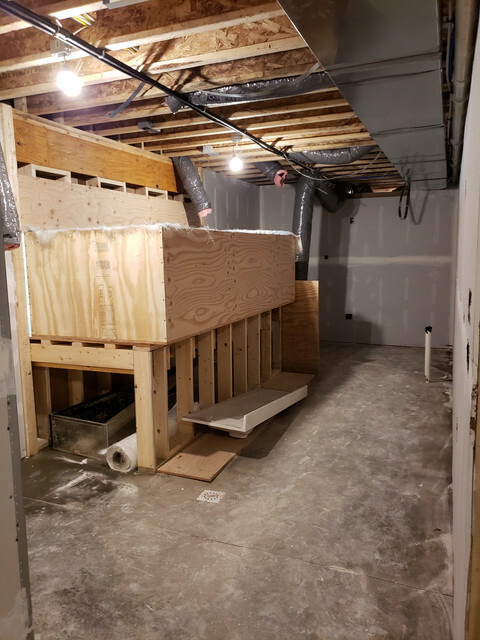 Now after 8 months of working on the house, I am finally able to start working on the tank. I also need to make a living while I build my own house, so my time to work on this house has been limited to lots of weekends and the occasional late night. So the slow build of the house might make this tank build take a while, but I hope you all enjoy the ride as much as I will. 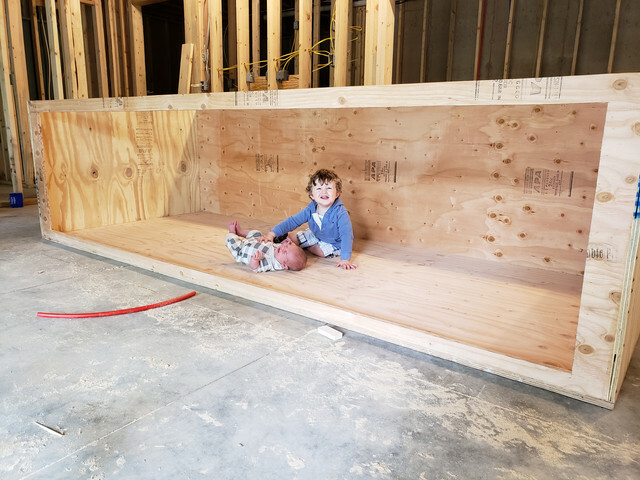 The Tank will be 120” long x 48” deep x 32” tall plywood tank (798 gallons). The total sytem volume should be somewhere around 1200 gallons. 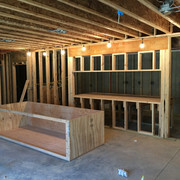 The tank will be in the wall facing the family room of our walkout basement. 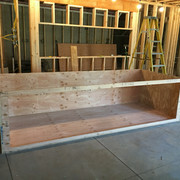 A 240 square foot fish room (10x24) will house the tank and all of its filtration. I’m planning on the tank to be a mixed reef with a rock wall on the back and two sides of the tank. The family room will have wainscoting paneling 3 ft. up the wall. My goal is to incorporate the wainscoting into the exterior wall of the tank and make it feel like a part of the room. I am not one to get caught up spending money on unnecessary things in this hobby. I always try to get my best value in the equipment I buy. Because of this I will be building a plywood tank. As I stated above, my construction background helps me with being comfortable with this endeavor. I also won’t be spending tons of money on the newest latest and greatest things also. I try to buy things used if I cannot build them myself. Step by step plans for building the tank. 3. Once the box is made I’m going to Fiberglass the inside of the box. Special attention to the corners will be made. Will also add Black paint to the fiberglass. 6. Install a (rough measurements) 120"x30"x3/4 Low iron Glass over the hole facing down. Place 1/8 spacers in caulk to insure good bead. Have a powered caulk gun for this already. 8. 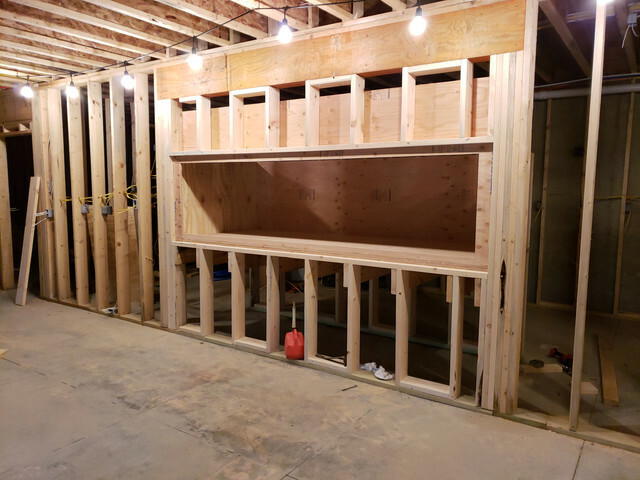 I will then be building a 2x4 wall around the tank level with the height of the tank and securing the wall to the structural wall of the house. 9. I will be setting the tank back 2" into the 2x6 wall the hole is already in. I will use this 2" to put structural trim on the front side of the tank with the glass panel. This will be done all the way around the hole to help support the front edges. 11. After plumbing is done I’m going to foam a good portion of the 2x4 wall with a closed cell foam. This is done for 2 reasons. 1. Insulation of the tank since it’s in a cool basement. 2. Structural support between the plywood of the tank and the 2x4 walls. I know since the tank cannot be screwed to the wall, this will be a good way to tie them together. 12. 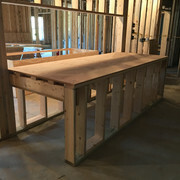 At the end I am going to work on some sort of top bracing from the 2x4 wall, to the front of the tank/2x6 front wall. I will be running 4 250w metal halide lights, so my goal is to adjust the front bracing to that it doesn’t interfere with the lighting. The stand will be made with 2 rows of 2x6s 16” OC on the front and back of the tank and 2x8s spanning for support in the middle of the tank. I will probably put a center “wall” in the stand also, but I hate losing the storage space under the tank. Once the tank and stand are built, I will be making a raised 12” walkway around the tank. 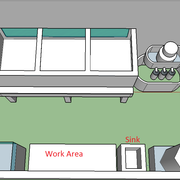 Im not sure of the height of this walkway yet, but I want to be able to work in the tank and be comfortable. I will be using a 150 Gallon Rubbermaid stock tank. 4 Filter socks coming from the display tank to help with sediments. My whole house will be a Samsung “smart things” house. This allows me to hook up timers, cameras, water leak sensors, and ive found I can even hook up a temperature probe to the tank. 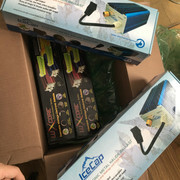 Im not 100% sold on reliability because its untested on fish tanks, so some of the major items will wait for a while before they are setup on this system. The room is wired so that every outlet is prewired with a switch. All the switches are in the same area for ease of use. I plan on putting the lights and maybe automatic feeder on this system to start. Then if my kids want to watch a movie in the family room, all they say is “google, turn off the fish tank light”. The lights turn off for up to 3 hours, but stay on a normal schedule other than that time. Same thing with the feeder (still working on this). Kids can feed the tank using voice control and I can make it so the tank will only feed so many times a day no matter how many times the kids try. I want the kids to interact with the tank, but stay out of my fish room when I’m not there…. Door will be locked!!! Someday I’m sure I will add a controller when the technology is better for testing Calc, Mag, and Alk. Until they become more affordable, this will work. I plan to make a lighting rack to over the display rack. My goal is to hook up a winch to this to raise and lower the rack as needed when working in the tank. Display tank will have 4 250w Metal halides. Additional Blue supplemental lighting will be added later. Nothing fancy, just some blue LED strip lights. This thing is a beast. Ive looked at other Skimmers rated for a tank this size and most are not near this size. Im hoping it will exceed my expectations. I bought it used, so its worth a try! 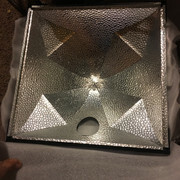 •	Base footprint 10" x 10"
Ive had this for my 220 gallon tank for 3 years and never set it up. Its too small for this tanks water volume, but I was told I will just be replacing the media more often. If this is a problem then ill upgrade later. This tank is my current frag tank. I plan on putting Mangroves and Macro algae and having it be somewhat of a display refugium. The frag tank will have 2 metal halides exactly the same as the display tank. 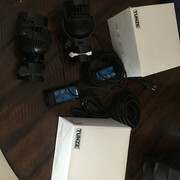 I have a few old Tunze powerheads for the frag tank. To start, I will have two Tunze 6255 powerheads on each end of the tank. These have a extremely wide output compared to most powerheads, Im throwing around the idea,, of a Gyre xf 280 in the middle of the tank on the back wall, but this can come later if needed. •	for tanks up to 1,050 gallons. I bought a 130cfm Exhaust fan. Being in Indiana it I ill probably need to get a dehumidifier also that runs into my sump pump. 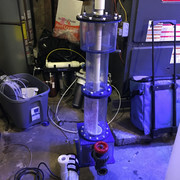 I want to dabble into fish breeding, so im getting this setup used from a buddy. Pretty sweet setup i think. Last edited by Atomic081; 04/30/2018 at 09:36 AM. Congrats on the dream home! As a builder of a 540 gallon plywood tank that was up for over 5 years with 0 issues you will not regret it. When we tore the tank down (a few weeks ago due to us moving into our dream home) it took 30 sawzaw blades and the guy helping me could not believe how good the tank still looked "under the hood" so to speak, the wood looked just as good as the day I bought it. We also quickly realized that tank would have stood longer than the house and possibly humanity! 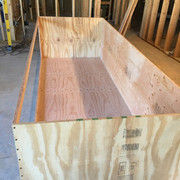 Just don't cut corners - use fiberglass cloth, paint the outside of the tank as well ( I used drylock) and use framing on the outside of the tank for structural stability (it will bow/warp over time without).These tanks when built right will last a lifetime and I would personally have more confidence in one of these vs a traditional aquarium over the long haul. Good luck with the build, I love following builds like this as it's not just the typical everything is just bought - this is a true "build" take pride in that! Current Tank Info: 500 gallon reef build, progress is slo-mo! Looking through your album it looked like there is a crack on the bottom of the wood towards the right middle. 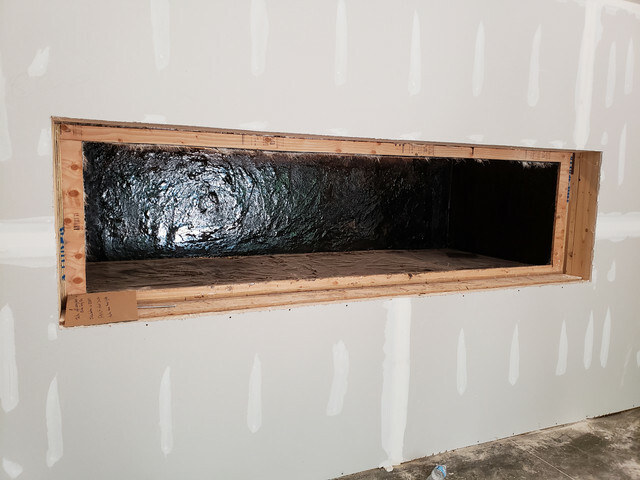 Is the fiberglass going to fill that in and keep the structural integrity? Just curious since I've never done a plywood tank. This is going to be awesome. Following along! I'm interested in the build process for the tank itself. Very cool build overall! Thank you so much. Im trying to take every precaution to over build this this thing to the max. Hopefully it will be as solid as yours. Im still nervous though. hopefully ill encourage others to do the same!! Sounds like a great plan! Building a dream home and tank simultaneously is a dream of mine as well. Jealous! Tank is in place. Fiberglass should come in soon. Obligatory photo of kids in the tank. They insulated the house this week. My foam guy is going to foam the wall around the tank after its built for FREE!!!! He also wants to foam the bottom of the tank to help hold in heat. I do alot of business with him but this will really make the back wall super strong. Anyone in the indiana area need foam work done, i highly recommend All Seasons Insulation!!!!! I can see that this is going to be a great tank build, I love the DIY spirit as well as the mindset that new equipment doesn't make for an awesome tank. I also like the idea of incorporating “smart things” into the build. 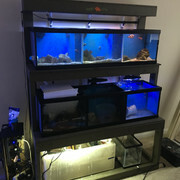 I don't even have my tank build done yet but I'm running into the same problem with the lights, I have a couple light fixture setup on the apex to get an idea of schedule and every time they sit down to watch tv, they want me to turn the lights off. I was going to add a push button switch on the outside to kill the lights for 2 hour increments for movie watching. I wonder if apex and google can interface, it would be nice to say, "ok google, turn off the tank lights" and that would prompt a command to fusion???? I'm sure that that would be a programming nightmare. I'm definitely following along and will chime in from time to time. thanks for sharing!!! Maybe just build in a couple hooks/posts and then hang a curtain of sorts over the tank when necessary. Super easy and requires no programming. If you do it right, it will also look nice (not like it'll be up anyway). It seems this will turn out nice! That skimmer looks very familiar! Actually it’s my exact old one. I sold it a few months ago and it’s a beast like you said. I use to live in rushville but now live south of greensburg in Versailles. I thought I sold it to a guy who said he was a couple hours from me. But either way you have a sweet setup and good luck. You can incorporate Apex and Alexa -- My Alexa switches the color of the tank lights and also feeds the fish (2 different frozen foods). For better integration of your 'smart things' and control - take a look at Universal Devices ISY994i - For a central host. Next step up is to look into RTI -- Much more pricey - but integrates everything into tablet controls built into the walls, or portable. Fiberglassed the tank last weekend and the house is having drywall installed right now. I also bought my rubbermaid 150g sump. Pictures coming soon! I fiberglassed the tank and put 6 layers of mesh in the corners and 2 layers of mesh on the side walls. Next I need to order the the epoxy to waterproof the tank. Full shot of fish room while its being drywalled. 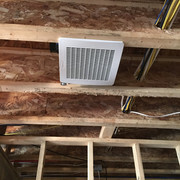 I still have hvac work to do in the ceiling. If you don't mind me asking how much does a tank this size cost made of plywood compared to acrylic and glass? Any idea? I'll have about 2 grand in the tank. I got a quote for a glass 8' tank and it was 18 thousand. wow, and that's not the size you wanted anyway... You have the skills, might as well use them for what you want.. Thanks for the pictures. Thanks for the info. That is a crazy number for a glass one. Was it made of gold, LOL! I am considering making one out of acrylic. Did you price out one in that? Current Tank Info: ~30 lbs of LR w/ 15 lbs of substrate. An azure damsel, six-lined wrasse, and black blenny. Zoanthids and shrooms. No real wood working skills needed in most cases. Places will cut your wood for you to size. You just have to glue, screw, fiberglass, paint, place glass, silicone, etc. all of its time consuming, yes but well worth it and way cheaper. I’m starting my 8x4x4 build next week. Just need to reroute the washer/dryer to the garage so I can start the stand in the Fish room.